Do you do a lot of business travel for your job? If so, we’re sure that you have some items that you’ve come to depend on for your trips away from home. We’ve rounded up a list of products from our catalog that we believe are must-haves for the next time you travel for business. What’s inside our business travel bag? 1.West Loop AUTOSEAL Travel Mug: this mug utilizes a convenient AUTOSEAL® lid that automatically seals between sips to eliminate spills and leaks. Travel mug with easy-clean lid has a thoughtfully designed lid that pivots open, making it easy to clean. 2.Red Bull: Medical studies show that Red Bull makes you feel significantly more energetic and improves your ability to focus and concentrate. 6. KIND Healthy Grains Bar: Each bar packs more than one full serving of whole grains which provides fiber and protein. Baked from a good-for-you foundation of super grains; Millet, Quinoa, Buckwheat, and Amaranth. Perfectly chewy-with-a-crunch bars provide a tasty anytime snack. 3. Wet Ones: Keep hands and face free from germs and harmful bacteria. Thick, soft, and strong wipes provide a healthy alternative if soap and water aren’t available. 4. Restore Conditioning Shampoo & Body Wash: Handy shampoo and body wash in single-portion bottles are designed with stylish packaging and add an enticing fragrance. 8. Unwrapped Amenity Bar Soap: A rich, luxurious lather and a pleasant, neutral scent lend it a spa-like appeal. Gentle enough for everyday use. 10. Advil Ibuprofen: Effective for headaches, backaches, muscle aches, menstrual pain, minor arthritis and other joint pain, body aches and pains from the flu. Packaged for individual use to replenish first aid stations and kits. 7. Store N’ Go USB 2.0 Flash Drive: USB drive gives you the ability to capture all your data in one small, convenient location and move that information with you throughout the day. The retractable housing easily slides in and out—no cap to lose. 9.Galaxy Tab A 9.7″ Tablet with S Pen, 16 GB, Wi-Fi: Empower your team to work from anywhere. The Samsung Galaxy Tab® A is a powerful business tool designed to improve productivity and workflow efficiencies throughout the mobile enterprise. Improve your productivity through real-time communication. The preloaded Microsoft Office suite allows you to work as if you were on a desktop or laptop. 11. International Travel Plug Adapter for Notebook PC/Cell Phone, 110V: This all-in-one unit provides plug adapters for use in more than 150 countries. This adapter has built-in slide-out plugs so you won’t have to worry about losing any pieces. 13. Headphones: Comfort headphone with in-line microphone. Tangle-free flat cable. Full sound 40mm drivers. 3.5mm output jack for daisy-chaining/sharing music. Five-foot cord. 16. Apple Lightning Cable, 10 ft.: Apple® certified Lightning® cable. Heavy duty. Rapid data transfer. 15. Travel Docking Station: An ultra-portable connectivity tool for serious mobile professionals and presenters, offering VGA and HDMI video ports, a Gigabit Ethernet port and 2 USB 3.0 ports all packed into an innovative design that’s the size of a smartphone. Worry about your presentation, not your technology, and add this lightweight, versatile USB-powered dock to your mobile gear. 5. Moleskine Ruled Notebook: This classic notebook is perfect for capturing thoughts, ideas and important notes. Elastic band closure, ribbon bookmark, and expandable inner pocket all match the cover color, providing a coordinated appearance. 12. Classic Tote: Fully padded 15.6″ laptop compartment. Top zippered closure. Interior organizer section with a key clip. Stylish interior lining. Rear pocket. Metal feet protect bottom of the bag. Adjustable shoulder straps. 14. Executive Leather Briefcase: Fully padded 16″ laptop compartment. Front buckle closures to secure laptop. Two front organizer pockets. Rear file pocket with magnetic snap closure. Padded carry handle. Removable/adjustable shoulder strap. 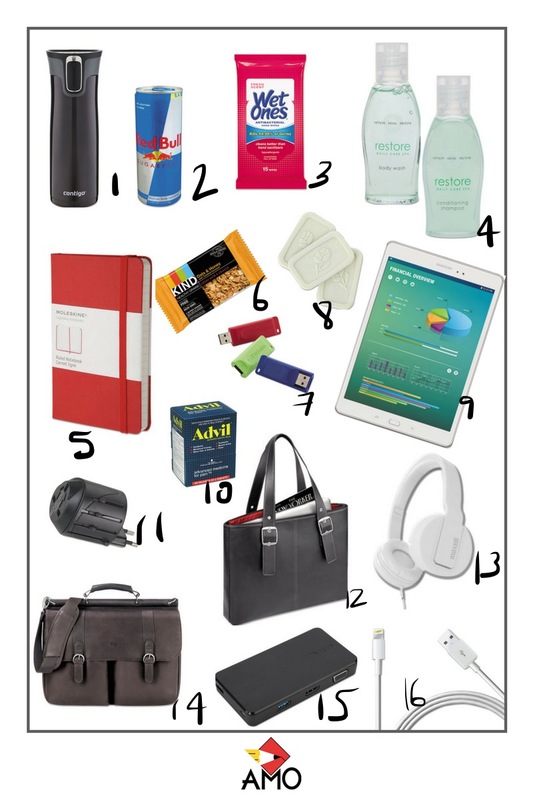 What’s in your business travel bag? We left some things off that we don’t have available in our catalog like a good book or a magazine. Do you like lists like this? Check this out and make sure to check back to our blog weekly for posts!